By Jesse Dolphin Hello fellow tattooer and close followers. TAM just took part in one of the smoothest running conventions this year. Montreal is a beautiful city with its fair share of beautiful tattooed people. The convention was held a the Gare Windsor, a remodeled, beautiful old train station with the natural lighting and its open concept it gave a fresh and inspiring surrounding. Pierre and his wife Val have been doing this convention for a few years now and have an understanding of what makes a good show... The line-up for the show was again impressive, tattooers from all over the globe were in attendance. Filip Leu was going make an appearance this year but sadly had to cancel. Bummer. 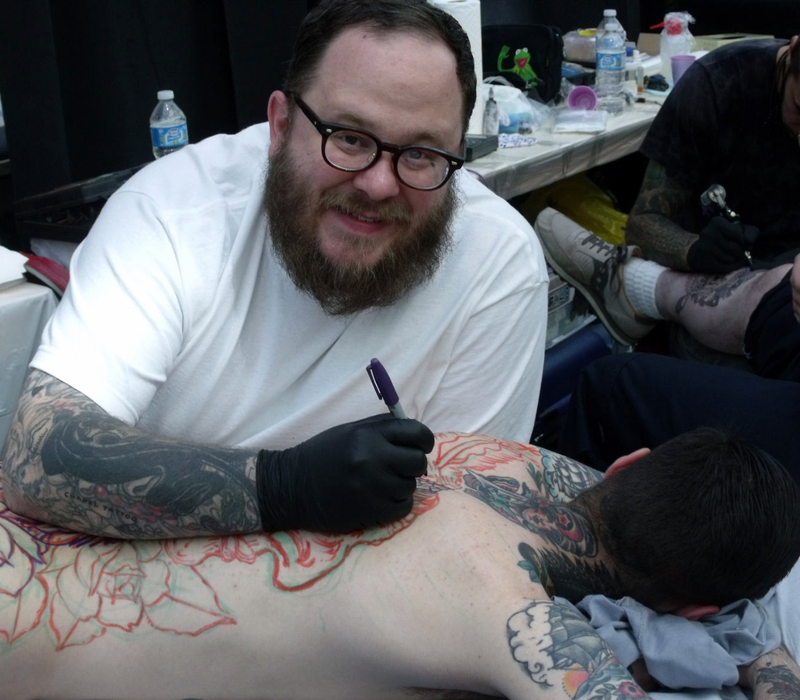 Lots of other great tattooers made the show, Grime was up, along with Mike Rubendall. Todd Noble was up and a funny story, I called him, "Derek..." He was a little mad. And what can I say, I was rooked into doing so. Funny. Crazy you would never think so, but Canada has a wicked talent pool of tattooers. Steve Moore was out from Nanaimo, displaying mad skill, along with Dave Cummings from PSC in Montreal. 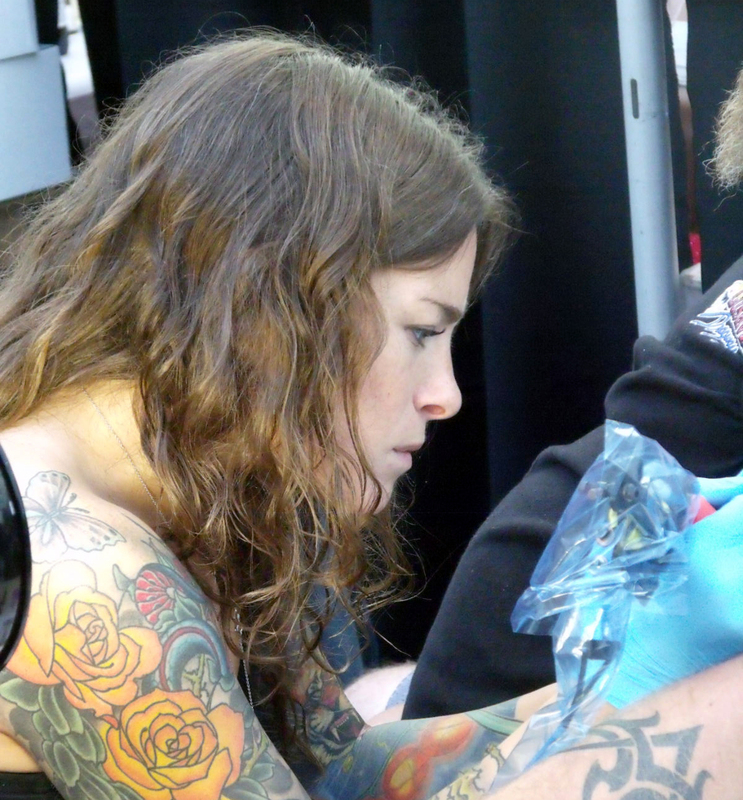 Tattoo Mania from Montreal was in full display housing a line of talent... And where did all these great girl tattooers come from? The ladies got skills. Chad Koeplinger, I think he is the hardest working man in tattooing. He was a machine, drawing on everything he tattooed. Sketched on a full Indian chief with full headdress on a guy's back. Then lined it in about two hours. Wicked. I had a old-timer pop over to the booth. He was asking me about old issues. I had a couple of back issues of TAM so I grabbed the Filip Leu issue #7 to show him. It turns out it was Tony D'Anessa... He was interviewed in the issue I had just given him to look at. Crazy when he opened the book to his interview. We laughed about the coincidence and how young he was in the photos. It was cool to hang with Tony, talking about how the industry has moved so fast into a worldwide art form. And now tattooing is recognized as a real art form and not the stigma that has been so long associated with this form of expression and art classification. People joining this movement today don't realize that there was a great deal of effort and sacrifice to get the tattoo community to were it is today. Thanks and "God bless ink." (Jesse Dolphin is a tattooer and contributing blogger for Tattoo Artist Magazine.) For more info on the Montreal convention visit their site: http://www.arttattoomontreal.com.